Getting my apartment was surprisingly easy. I picked it out on Saturday and went to Jacky’s office early on Tuesday morning, armed with my passport and an enormous stack of renminbi (the largest denomination is a 100RMB bill; I had seventy-nine of them to pay my first month’s rent and Jacky’s commission). Bathrobe Guy showed up a few minutes after I did and we both set about signing multiple copies of my lease. After I handed over the money, the three of us walked down to the apartment and I checked it out to make sure everything looked okay. It did. Bathrobe Guy left me the keys, picked up the last of his things, and left me to settle in. Now, I realized, the hard part would begin. The apartment comes with basic furniture (bed, sofas, a narrow table that I put in my bedroom), but nothing else. I need … everything. Linens, towels, silverware, plates, glasses—EVERYTHING. I went to IKEA. Where else? 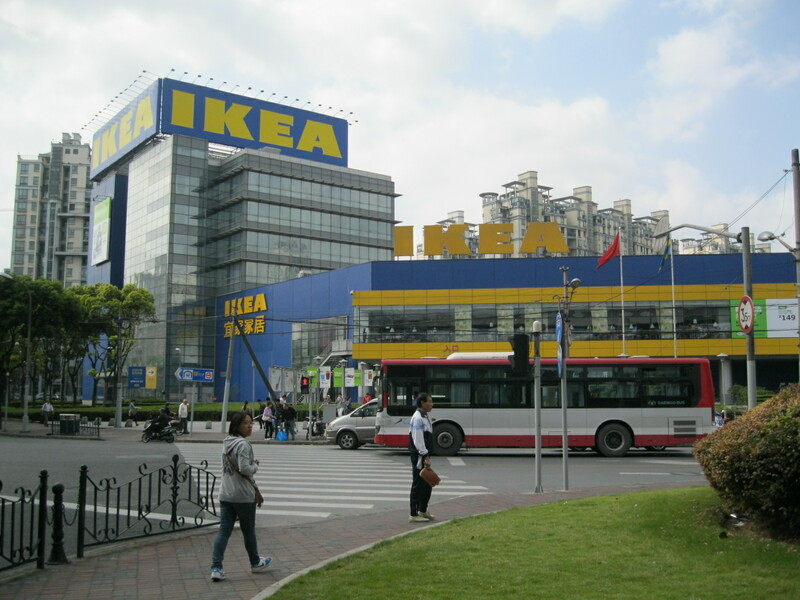 IKEA is something of a phenomenon in Shanghai these days. When I was reading real estate ads online, I saw a lot of places described as “IKEA-style”: these apartments featured lots of light wood, strong geometric lines, and tons of storage space. My apartment is definitely IKEA-style in construction (my closet here is easily the largest one I’ve ever had in my life—it occupies an entire wall of the bedroom), and it will soon be IKEA-style in decoration as well. There’s a germ of truth in those reports. After three trips to the store,2 I haven’t yet seen anyone asleep in the IKEA showroom, but I’ve seen plenty of people sitting around and playing with their smartphones (not at all different from the U.S., though). The IKEA Family Card, available for free, does entitle the card-holder to unlimited hot drinks in the restaurant, and it does seem that customers here are enamored of this perk. But in many other ways, my visits to IKEA have been more familiar than not; in fact, the layout of the store is so identical to those in the U.S. that sometimes I forget I’m not in Plymouth Meeting, PA. Stories about extreme behavior would lead you to believe that Chinese IKEA-goers just come to window-shop, relax, and drink free tea. In fact, the store does quite a business. In the showroom, I saw lots of couples and pairs of women shopping together, carefully measuring pieces of furniture and arguing over which item would be the best choice. (On the other hand, I didn’t see all that many people loading boxes onto handcarts in the warehouse section of the store; I wondered if maybe customers here are more likely to order things for delivery, rather than pick up and transport the unassembled furniture themselves). The Marketplace section, where home goods of all kinds are sold, was jam-packed, and the cash register lines were filled with people buying cartloads of kitchenware, sheets, plants, and throw pillows. What I found even more interesting, though, was the popularity of the little grocery section located after the cash registers. This is where IKEA sells various Swedish food products, like gravlax and lingonberry juice, and people were buying them in droves. They weren’t necessarily purchasing the most exotic stuff, but the checkout line was full of customers with chocolate bars, marshmallow candy, and yellow mustard (which is one of this month’s special deals for Family Card holders). I also saw several stylish twentysomethings taking photos of various food items with large and flashy digital cameras. I think that, like the food court in a mall or concession stands at a World’s Fair, the IKEA market offers people a “safe space” to experiment and taste a bit of foreign culture at a reasonable price. To sound like an academic (why fight it? ): I don’t doubt that people in Shanghai engage with IKEA in different ways than their counterparts in the United States or Europe. I do think, however, that the focus some journalists have placed on what seems to Westerners like extreme behavior obscures the more nuanced ways in which IKEA here has a special Shanghai flavor. Free coffee and tea? Yes, they’re popular. But in a strong consumer economy like Shanghai’s, so are inexpensive cooking pots and decorative candles. At the end of the day, there’s no question in my mind that the Shanghainese want what IKEA’s selling. As do I. Time for IKEA trip number four.